Lara's Loose Threads: Hey look - I stitched something! And blogged about it! Hey look - I stitched something! And blogged about it! 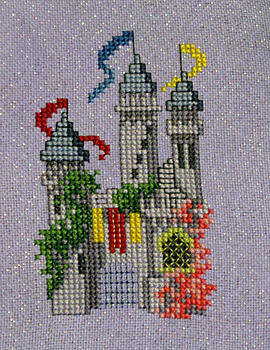 I've taken a break from the cottage in the post below since I was getting bored with all of the browns, so I pulled this little castle from 501 Cross Stitch Designs by Sam Hawkins and stitched it up on some spangly Silkweaver fabric. I haven't decided what I'll do for the final finishing, so it's going to the "to be rinsed" pile and eventually the "to be framed/finished" basket until I think of something cute to do with it. In the meantime, I've started the Blue Ribbon Designs Christmas ornament in the July/August issue of Just Cross Stitch magazine. It's been a miserably hot summer here in Texas already (actually, it started in early June, which is technically still spring - 106F... really???) so dreams of Christmas is just the relief I need. Actually, I'm most looking forward to the *next* JCS issue, which will be their annual Halloween issue. Just a quick look through the blog will show that I have a big thing for Halloween and Autumn designs! And speaking of, I've already pre-ordered the Just Cross Stitch Halloween Collection book that is coming in September. A few weeks ago I finally broke down and bought a new floor stand to use for my larger projects. I have one that clamps at the top, but unfortunately the two big designs that I've put on the Q-snaps are just too heavy for it, so I had to get one that clamped on both sides. And after first getting the wrong item (which was resolved quickly and at no extra charge to me), I now have a Stitch Master stand for my big projects. It holds the Q-snaps pretty well, but I might need to play around with it some to get a bit more of a secure fit. I haven't actually started stitching with it yet, but I think it will work well for large designs. That's it for this update... hopefully there won't be another three-month gap before I blog here again! Here is a tip if you can find those ankle weight things at a resale shop, you can strap them to the bottom of your stand to weight it down and make it less tippy.